With the upcoming Royal Wedding, it is the perfect time to rediscover Woods of Windsor - the iconic heritage brand capturing all that is most glorious about our nation in full bloom, infused with a charm and romance that is unmistakably English. To mark this auspicious occasion, Woods of Windsor have partnered with Daniel Stores to celebrate in a way that is quintessentially British – Afternoon Tea! Be taken on a journey through the products that were first conceptualised and created in this very town. Woods of Windsor, like the Royal Wedding flowers, draws inspiration from locally sourced foliage including the Royal parks and gardens alike, began as a local apothecary as far back as 1770 serving not only the townsfolk of Windsor, but also the Royal family and its distinguished visitors. From packaging to product, Woods of Windsor encapsulates everything regal and represents the beauty found in Windsor Great Park. The range includes Eau De Toilettes, Bath & Shower Gels, Hand Creams, Hand Washes, Dusting Powders and Luxury Soap. Everything you need to feel positively noble! 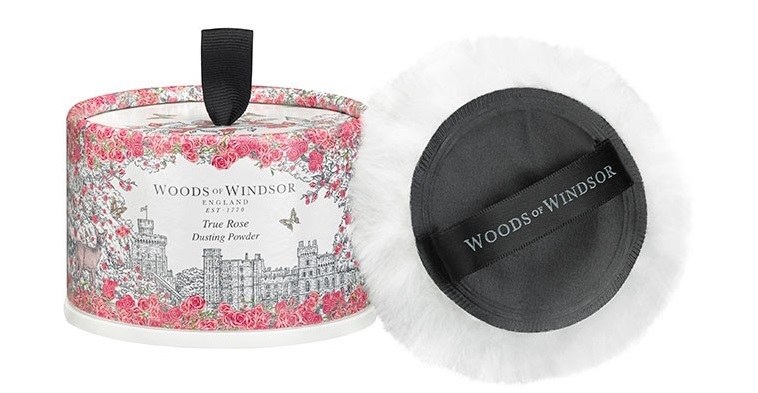 Introducing the True Rose – Dusting Powder – RRP £9.99 A product truly fit for a princess, the Woods of Windsor dusting powder is a must for anyone’s big day, royal or otherwise! An elegant rose petal scent that combines crisp green violet leaves with rose otto and a warm damask rose, to create delicate English Classic. Lightly dust onto the skin with soft body puff enclosed to seal in moisture and leave it delicately fragrance.